Many may know Robert Downey Jr as the main actor behind Ironman, but probably not many knew he has a challenging childhood to begin with. At 6 years old, he was introduced to drugs by his father. By age 8, he was addicted. His parents got divorced when he was 13. At age 20, he met a girl and their relationship went on for 7 years. Until his addiction become so strong, it tears them apart. After losing control of his life, he ended up going to jail for multiple crime he committed. He was beaten up so badly in prison, that he woke up in a pool of his own blood twice. After finally coming out of jail, things didn't got any better. His wife sued him for divorce. He would spent his days scrubbing pans at 8 cents per hour. At 2003, things begin to change when he met a strong and determined woman. Prior to proposing to her, she made him promised to give up drugs completely. He managed to get off drug addiction within one year. In 2007, his fortune start to change for the better as he landed off a role in Ironman and till today he's one of the highest paid actor. Let's examine his chart further. 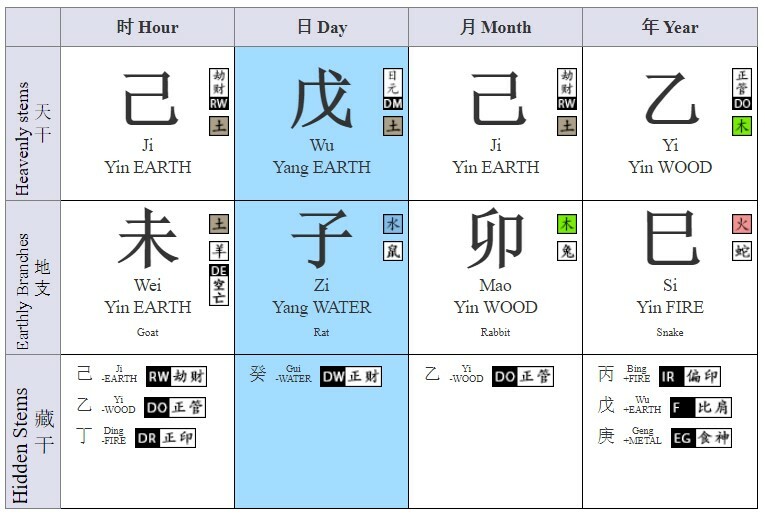 Being a 戊 Earth daymaster, this is a strong chart. 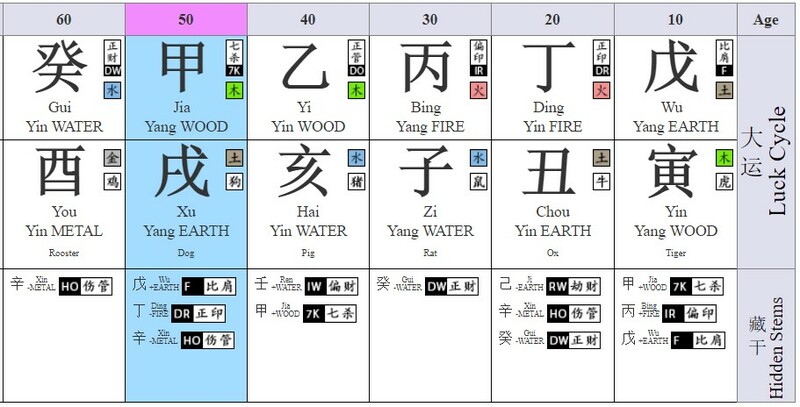 Knowing the strength of a Bazi chart is the first step to evaluating the positive and negative phase and elements. A strong chart isn't always a better chart, neither a weak chart means it's not a good chart. It comes down to what luck pillar and 10 God is in the natal chart. The key in decoding a Bazi chart is balance, just like the art of Feng shui seeks balance. First and foremost, we can see there is 2 Direct Officer stars in the natal chart. The Direct Officer stars can represent discipline in a person characteristic as well as potential legal problem. Such stars is responsible for him losing control of his life and getting in and out of jail. Being a strong chart, going to a Resource luck pillar phase will worsen it. His early days with the luck pillar is certainly not supporting. The key element of Resource also means it has the ability to counter Output stars. THe output stars are crucial to a strong chart success as it represent the person's ability to make good decision, possess rational thoughts process and creative ideas. Most strong chart I've analysed can experience depression if especially the output star are being countered badly. His fortune changed after he entered 乙亥 Yi Hai Luck Pillar at age 40 onward. From year 2010 - 2013, it is a series of Output stars and Wealth stars years strengthening his wealth further for a strong daymaster. The robwealth star is regarded as a negative wealth star in his chart and having 乙 wood to take care of his stars certainly means his wealth is only going to be strengthen further. For someone like him who have fallen through the cracks during his early days, it doesn't means all is doomed as long the luck pillar comes in and balance up the whole chart. Clearly, it also means if you are going through a nasty patch right now, identify which phase of the luck pillar is going to support you further is the key step for you not to give up and make well informed decisions in the upcoming years ahead.